General Minister and President Terri Hord Owens opened the event on Monday night. 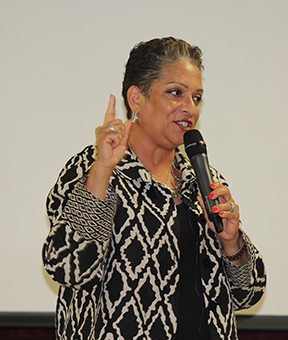 National Benevolent Association‘s (NBA) Angela Whitenhill, mental health initiative manager, led two DOCTalk sessions on Health. Exploring key elements of change and transformation, Whitenhill discussed barriers to healthy transformation and offered effective mental and spiritual wellness strategies for resilient, soul nurturing ministry. Change is inevitable during times of transition, and according to Whitenhill, it is important that clergy and church leaders have time to pause and reflect on their own transformative process as it relates to the growth and development of their congregation. Staff from Disciples Church Extension Fund (DCEF) offered expertise on building and capital resources. Craig Walls, advisor, explored the many opportunities and challenges that go along with creating holy places where people encounter God during “10 Building Observations from a New Church Planter.” Rick Reisinger, president, shared stories of congregations that have partnered with social service organizations, their surrounding communities, and DCEF to use their buildings for social service outreach. Jennifer Gallagher, DCEF chief financial officer, walked participants through the nuts and bolts of developing a solid financial structure for their congregations. Additionally, Bruce Barkhauer, minister for faith and giving for the Christian Church (Disciples of Christ), presented on crafting narrative budgets and stimulating a culture of financial generosity in local churches. Kasi Zieminski, director of marketing with NBA, and Tom Morse, executive of mission engagement with Global Ministries, presented workshops on beginning and advanced marketing and technology applications. Participants learned about the latest advances in marketing and technology and how to apply them to specific ministry contexts, as well as how to develop a mission-focused social media campaign. 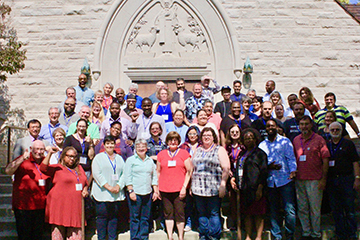 Monique Crain Spells, director of recruitment at Christian Theological Seminary, shared personal testimony about her experience planting a house church in Indianapolis and offered tips for modular ministry. Hope Partnership’s Rick Morse and Michael Whitman offered two workshops on understanding demographic tools to help explore solutions to complex strategic missional challenges. Laurie Budlong-Morse, LMFT, led a LEADLab on how recognizing and responding to our fears can lead us to more fulfillment in our personal lives, relationships, and ministries. The Start Track for new church planters before their project’s launch was led by Rich McCullen, Joey Cotto, Gilberto Collazo and Henzy Green. Kate Penny Howard and Terrell L McTyer led the Sustain Track for leaders whose projects have recently launched. Rick Morse and Michael Whitman led the Soar Track for pastoral teams seeking to revitalize and transform established congregations. 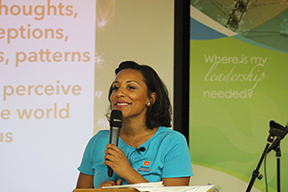 “I was especially pleased to see the church come together to bring leaders new ideas, ignite new dreams, and deepen passion for the transformation of the church,” said Terrell L McTyer, minister of new church strategies. Leadership Academy will be held in Indianapolis, September 17-21, 2018. For more information about Leadership Academy, email leadershipacademy@hopepmt.org.